The French leader Georges Clemenceau said: “War is too important to be left to the military.” It’s equally true that policing is too important to be left to the police and in the context of this place it’s essential that the past is too important to be left to the police. That’s why the so-called Legacy Investigations Branch (LIB) should not have been set up. There is neither the time, the money, nor the appropriate personnel for the LIB to carry out a meaningful role. That’s why the Stormont House Agreement plans to establish the Historical Investigations Unit and fund it. Setting aside the paltry resources available to the LIB there is the simple question of its propriety. It is a classic example of police arrogance. Yes, it’s well meaning and designed to be a stop gap, but there was no consultation with political parties or the public at large. What consultation there was came after the event and, according to Chief Constable George Hamilton, helped to establish the LIB priorities: none of them will be achieved in the time. As an organ of state it does not comply with the European Convention on Human Rights simply because, despite Assistant Chief Constable Will Kerr’s assertion, it is not independent. Indeed the chief constable appeared to admit that, in his BBC interview on Monday, when he said he would love ‘a completely independent’ inquiry body. That rather indicates the LIB is not. It’s not, because it’s run by the PSNI, the lineal descendant of the discredited RUC. If you’re under 40 and you haven’t read Anne Cadwallader’s outstanding Lethal Allies you won’t know that criminal conspiracy and collusion ran through the RUC, and especially RUC Special Branch, like the writing in a stick of seaside rock. Take one example from Lethal Allies, the attack on the Rock Bar at Granemore, County Armagh in June 1976. A gang arrived at the bar, shot a man walking away from it, then machine-gunned the bar and planted a 10lb gelignite bomb packed with shrapnel. Luckily only the detonator exploded. All the members of the gang were serving RUC officers. Apart from the three would-be killers others kept watch using a police car and a police radio. Some of the gang wore their uniforms under their overalls. One made it back to Keady barracks in time to take eye-witness statements. Note the HET’s inverted commas. The HET went on to wonder at “the lack of coordination and control by senior officers”. By the way, all the gang, including the notorious killer William ‘The Protestant Boy’ McCaughey, were given suspended sentences by the north’s Lord Chief Justice Lowry, apparently oblivious to the irony of his title. Lowry pointed out in his judgment that, “more than ordinary police work was needed and was justified to rid the land of the pestilence, which has been in existence”. Hmm. Such examples of police criminality can be multiplied many times not just in Co Armagh but as Baroness O’Loan showed, in Belfast too. 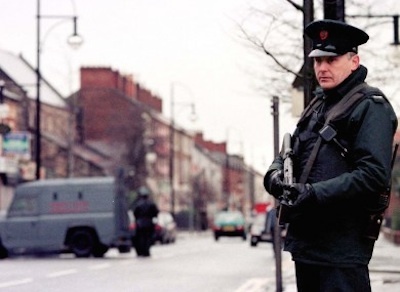 Now -- when you learn that of the 51 people in the LIB, 29 worked for RUC Special Branch or the PSNI’s Serious Crime Branch and 22 others were RUC or RUC civilian staff -- are you filled with confidence? There’s another aspect of PSNI interference. The Stormont House Agreement envisages an Independent Commission on Information Retrieval, (ICIR) through which people can receive information privately from former combatants. Yet the PSNI has already banjaxed that by its ham-fisted smash and grab raids on the Boston tapes. Who is going to give information to the ICIR with the likelihood of arrest by PC Plod? Remember they didn’t even know Bobby Storey was within his rights inquiring about Jean McConville for the Independent Commission on Victims’ Remains. Curiously the LIB is not mentioned in the Stormont House Agreement. Why did the politicians not know about it? Why did the politicians allow the police to do their own thing however well intentioned? It’s too important to give them free rein.